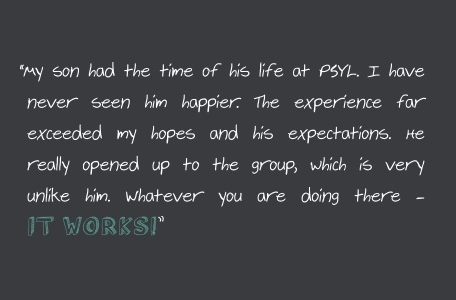 What do the parents of our participants say about PSYL? In utmost simplicity, PSYL changed my daughter's life. She already had the passion and the interest in her physical and spiritual environment but PSYL helped her develop skills to mature those ideas and move them from interests into actions. She is now a confident leader who shows calm awareness and understanding of all those she meets. She has learned how to problem solve and manage difficult interactions with caring and sensitivity. I am not sure where life will take her, but I know the skills she learned at PSYL have created the strongest foundation a parent could hope for. I first heard of PSYL through my daughter. I searched online and found the website to PSYL. I was quickly captivated by the idea that the focus was on building self-esteem and affirming one's ideas. This was a great opportunity for her to work on these aspects of her personality. Building self-confidence is a challenge for any 16 year-old, and we knew that we could not pass up this great opportunity to support her with this task. Since then, we have seen our daughter take on one challenge after another ... at times, we struggle to keep up with her! The experience at PSYL gave her the confidence to take risks, but most importantly, it raised her level of awareness with regards to world issues. Today, she is determined to be a leader and to invest her life on issues of poverty and social instability. Like all parents, we try to make the right choices for our children. We continue to note the impact of her time at PSYL and would, with a doubt, do it again. PSYL provides an amazing growth experience. Our two sons have attended in recent years. I would say the major learning for each of them was the direct experience that the world is interconnected. PSYL takes young people from all over the world, and they experience that there is not just one right way to do things or to live. At the same time, they learn what have in common, including in areas like care for the future, commitment to peace, resolving conflict and inequality. As a result, I think teens finish PSYL with more confidence that what they do matters. My sons came home with a new openness and commitment to being engaged in important questions ... and it is lasting. They also have close friends from many different countries and a great interest in travel – fantastic! And Skype helps in the meantime.